The beauty of natural cleaning ingredients is that each one serves multiple purposes within a home. This means the same bottle of vinegar, which is usually purchased for one sole purpose, may be used as a surface cleaner (just remember not to use it on granite or marble), daily shower spray, garbage disposal cleaner, and even laundry softener. 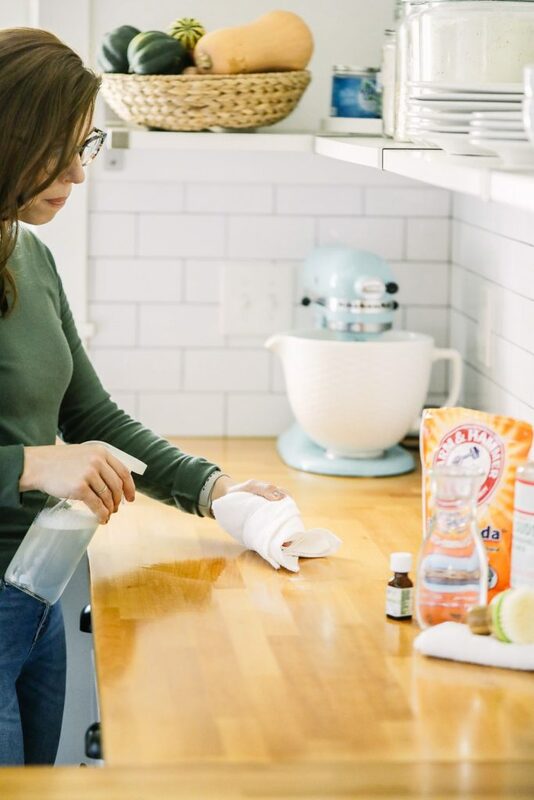 Nearly every ingredient added to a natural cleaning toolkit, from vinegar to castile soap, may be used in multiple ways to clean a home. This means natural cleaning, when you get past the initial investment, is also a budget-friendly lifestyle choice. That’s what I call a major double win! With the spring season upon us, my family is finally ready to get back outdoors (yes, it’s pretty amazing how even in Florida our backyard time is reduced during the “winter”), and begin planting seeds and seedlings in the garden, sprucing up the outdoor seating (hello, pollen, dirt, and mildew), and cleaning up the kids’ sandbox. 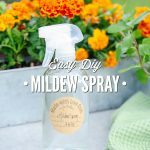 One of the greatest issues we face every year around this time, as we begin to cleanup after months of neglect, is mildew. This, my friend, is where the multi-purpose cleaning ingredient idea comes in to save the day, or at least my backyard cleaning extravaganza. 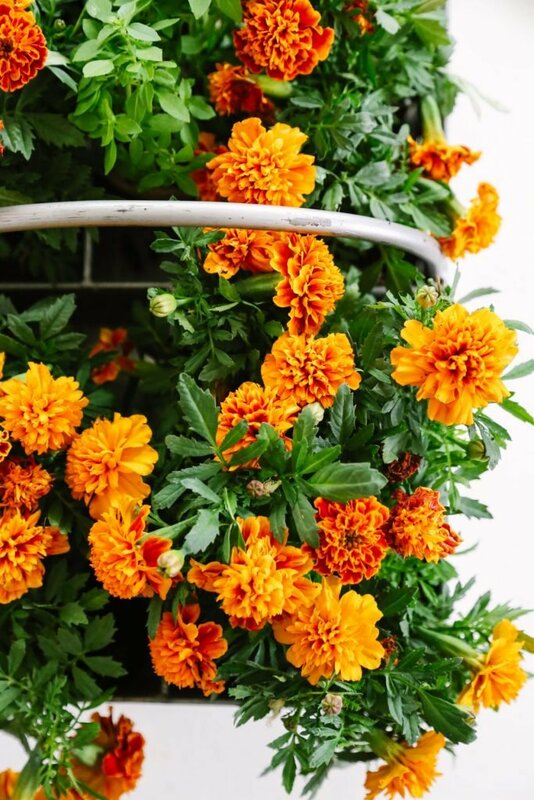 Over the years, I’ve experimented with a number of options for tackling the mildew that grows on outdoor surfaces, indoor flower pots, and even our bathroom tile. My experimentation has ranged from store-bought products to fancy do-it-yourself concoctions via YouTube. 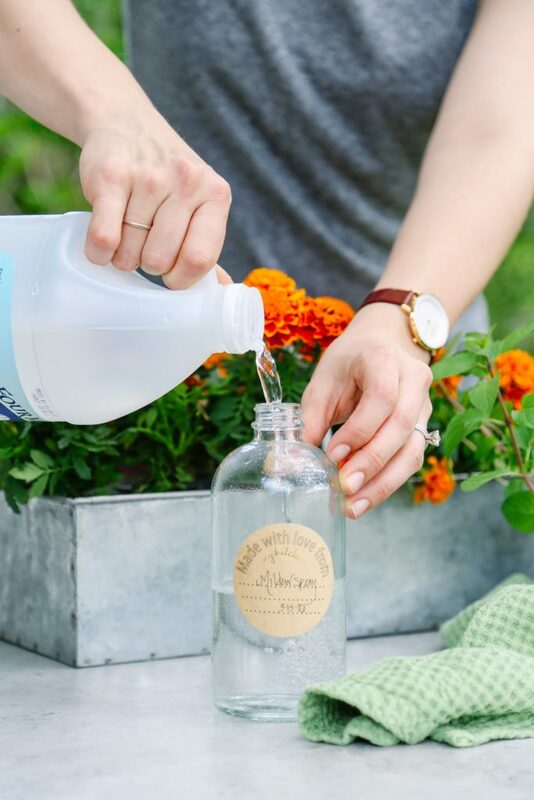 Last year, after researching how to tackle the mildew build-up on outdoor flower pots and indoor shower tile, I decided to try using my liquid fabric softener (which as you’ll remember only requires one ingredient: vinegar) to hopefully remove the mildew. I was so impressed with the final results that I’ve continued to use vinegar on other surfaces that regularly welcomed mildew. 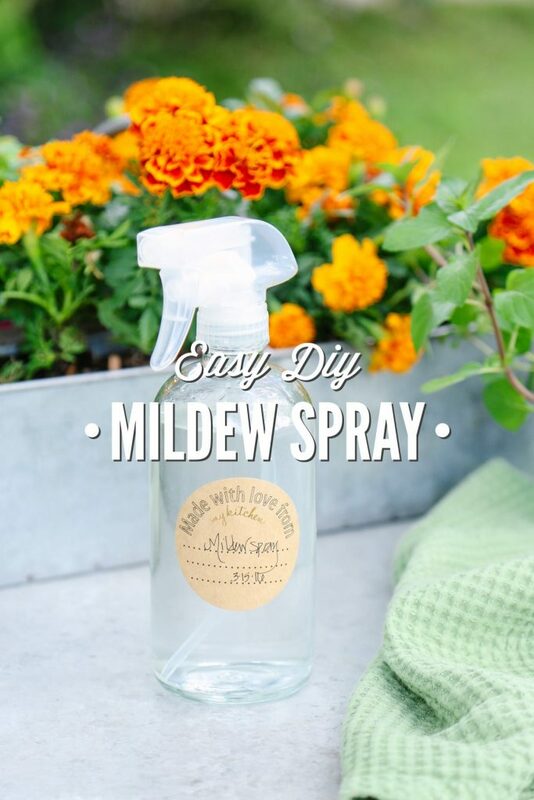 Sometimes, I’ll also scrub a pot or tile with baking soda before cleaning it with my Easy DIY Midew Spray, just for an added POW-WHAM! Do you see how the multi-purpose chat ties together now? Amazing, right?! The same natural ingredient that I use to soften my family’s clothes, may also be used to tackle mildew. 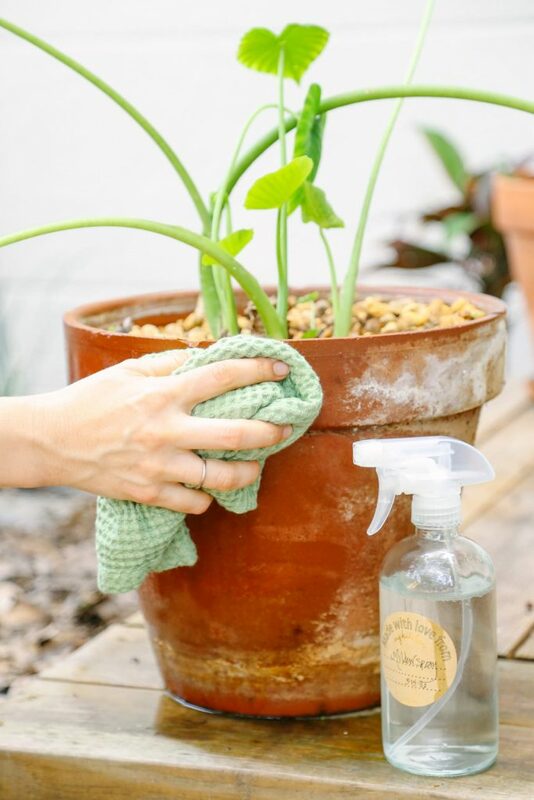 In the recipe notes, I’ve included an additional step that calls for baking soda, as mentioned above, just in case any mildew has left behind a stubborn stain on your favorite garden pot. Remember, vinegar and baking soda don’t get along when they’re combined, so if you plan to try my baking and vinegar POW combo, use them separately. Add the alcohol and essential oil to a spray bottle. Shake the bottle to combine the ingredients. Add the vinegar to the tea tree solution. 100% vinegar may be used in this recipe without the addition of the essential oil (and rubbing alcohol). 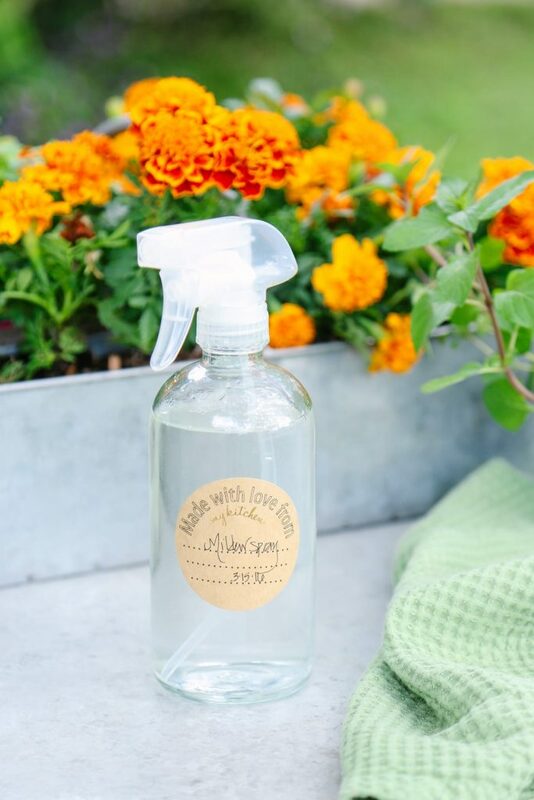 I keep tea tree in my cleaning toolkit for homemade cleaning and beauty products, so I add it to this spray due to its antibacterial and anti-fungal properties. I’ve found that about 60 drops of tea tree is best for the problematic mildew areas in my home. Remember to always test cleaners in a small area before spraying an entire surface with the cleaner. Vinegar shouldn’t be used on some surfaces, like marble and granite. 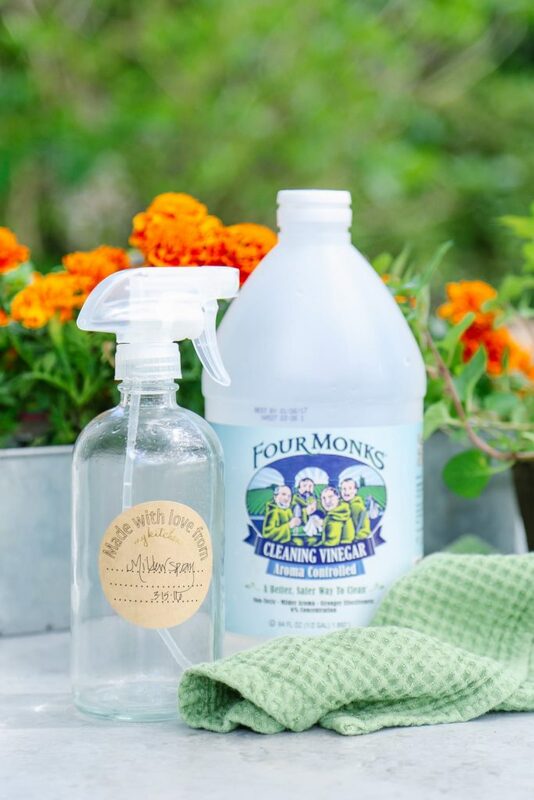 You can print a coupon for $1 off Four Monks Cleaning Vinegar, here. I am having problems with my shower curtain and the constant mold! Ugh mainly the pink kind. I know gross. I did try a little vinegar but I can’t use tea tree oil. Ideas? Hey Sharon, Here’s a great article with suggestions for the best essential oils to use: http://hybridrastamama.com/can-essential-oils-really-eliminate-toxic-mold/. Another option that may work better for you if the vinegar isn’t helping is hydrogen peroxide. Just spray the hydrogen peroxide on the problem area. The only issue is that hydrogen may bleach a surface, so if you have colored grout that may be an issue. Does it have to be 4 Monks Cleaning Vinegar or will plain old distilled vinegar work as well? 4 Monks doesn’t seem to be available in my area. Hey Michele, Any white vinegar will work great. That’s just what I used in this post. 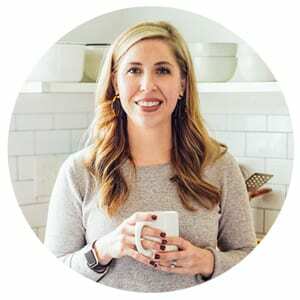 hi Kristin, Great way to clean of garden pots! One thing to note is vinegar can also be a really great weed (and plant) killer. Best to be mindful not to spray the plants in the pots. Would this also work on vinyl siding? thanks! Hey Debra, Yes, I believe so, but I would dilute the solution to a 50/50 water and vinegar. I’m sure that this question has been asked previously but where do you get your fantastic bottle labels?! And are they water proof? Thanks! Hey Kathleen, I source my labels from Target (dollar/value section), Michael’s Craft Store, and Amazon. The brown paper ones aren’t waterproof, but the chalk labels (on the bathroom cleaner) hold up well to water (just use a chalk pen). Where do you get your beautiful spray bottles? Hey Laura, I purchase my spray bottles from Sally Organic’s on Amazon: http://amzn.to/2c0bXCO. Thanks so much for the compliment. I hope Live Simply will continue to be of help to you along your natural living journey. Do you throw away the towels used to clean the moldy surfaces or wash them? Hey Emily, I wash them.